Yesterday, we had over 100 Chrysler employees and volunteers, including over 15 youth from the area, paint over graffiti all throughout parks and neighbourhoods in the west-end. It was extremely successful. 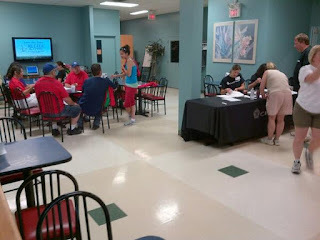 None of this would be possible without the United Way, the City of Windsor, Chrysler Canada, Centres for Seniors Windsor and the Our West End team and volunteers. Many residents in the area were extremely grateful and proud of the good work done by the volunteers. Yesterday, we not only painted over graffiti -- and there was a lot let me tell you -- but we began redefining what it means to live in the west-end. I could not be more proud of everyone involved in this great initiative. The Friends For Atkinson Parks and Pool group, in partnership with the City of Windsor, is offering subsidized swimming lessons for kids in the area. The pool is located at the Atkinson Park right off Riverside Dr. W. in between Bridge Ave. and Rankin Ave. The lessons are nearly free and last throughout the summer. For more information, please contact the Swim Co-Ordinator, Lynn Burns at 519-253-5465. Lynn will also be in the park (front lawn by the pool) this Saturday, June 22nd from noon until 3pm. The first session begins Tuesday, July 2nd so the deadline for registration is Wednesday, June 26. Lessons are Monday through Friday. There will be pre-registration for the following three sessions: July 22nd - August 2nd; August 6 - 16th; and the final session is August 19 - 30th. If you would like more parent info, please send me an email and I can pass that along to you as well. "...just moved here (Montcalm and Chappell). I enjoy your "Our West End" emails, it keeps me informed! I am from suburban Detroit and visit on a regular basis. One of my talents is making (and eating) Coney Island Hot Dogs! I sell kits to my friends. I was wondering if you could put a little blurb in the next newsletter that "The King of Coneys Detroit" has Coney Island Kits available at 3894 Montcalm. They include 8 buns, 8 jumbo hot dogs, a can of hot dog chili sauce and an onion all for $6.00! My sign should be out, just knock on the back door." 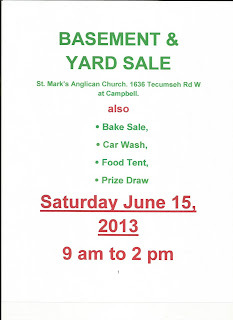 Annual Mission Club Yard Sale Holy Name of Mary Church Hall (down stairs), 681 McEwan. Friday, June 7th 5:00 p.m. - 7:00 p.m. Saturday, June 8th 9:00 a.m. - 2:00 p.m.
WEST END CRAWLERS MAY 2013 NEWSLETTER THE MONTH OF MAY STARTED OFF PRETTY GOOD! ON THE 6TH I MET WITH JENNIFER CLINE AT THE WELL-COME CENTRE FOR HUMAN POTENTIAL. SHE TOOK ME ON A TOUR THROUGH THEIR FACILITY, AND OPENED MY EYES TO SO MUCH NEED IN THE WEST END. THERE ARE TYPICALLY ABOUT 138 WOMEN WHO ACCESS THEIR SERVICES EVERY MONTH, AND ATTACH APPROXIMATELY 435 CHILDREN TO THAT NUMBER. IT’S JUST OVERWHELMING TO ME, HOW MUCH NEED THERE IS IN OUR COMMUNITY! MORE INFORMATION ABOUT THEM CAN BE FOUND ON THEIR WEB SITE: http://www.well-comecentre.com WEST END CRAWLERS IS DEDICATED TO COLLECTING ANYTHING WE CAN TO HELP THESE WOMEN AND THEIR CHILDREN! THEY ALSO OFFERED SPACE TO SORT CANNED GOODS COLLECTED FROM A FUTURE “STUFF THE TRUCK” CAMPAIGN! WE HAVE A NEW ADMIN FOR OUR GROUP! HER NAME IS LEE, AND SHE IS INTERESTED IN HELPING OUT AT EVENTS, AND HELPED DISTRIBUTE POSTERS FOR OUR YARD SALE THAT WAS HELD ON THE 25TH OF THE MONTH. "Hi fabio If possible can you mention we are having refreshments and snacks at the pharmasave on huron and tecumseh@ 10 am on thurs june 13 for a west end customer appreciation day. There will also be a draw for a gift certificate for a west end restaurant." Yesterday I tried the new Stathis Grill on College Ave. just east of Campbell. I live only a few blocks away and cannot tell you how happy I am to see this new place open up. I chatted with the owner for a bit who told me they were very busy over the weekend and many from the neighbourhood have stopped in to check it out. Many have already come for a second time. You can bet I will be there often given that I only live a few blocks away. We are lucky to have entrepreneurs like the Stathis family make investments for the betterment of our west-end. If you haven't yet, I highly recommend you check it out. The food and service is great! 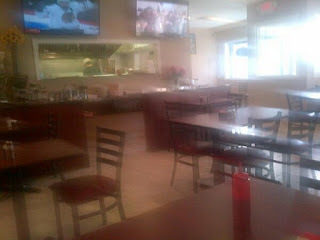 Below is a picture I took inside the restaurant that turned out a bit fuzzy. Getting Flat Tires on Prince Rd? I received an email from a west-ender in Sandwich Towne asking if anyone has been getting flat tires or noticing scraps all over Prince Rd? 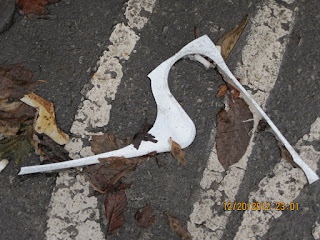 The GM at a local business on Prince has been notified and is currently in the process of figuring out why these scraps are all over the road.